Taxi centres have started to charge MVR100 for every trip from capital city Male to Velana International Airport (VIA) across the Sinamale Bridge. Whilst local taxi centres have announced the rates for the one-way drive, Transport Authority (TA) is yet to officially reveal the rates. According to local news media ‘Mihaaru’, Local Taxi, Dial Cab, and Fine Taxi are the local centres to have revealed the rate for the trip. The centres stated that they would adhere to the official rates when the Transport Authority revealed them. 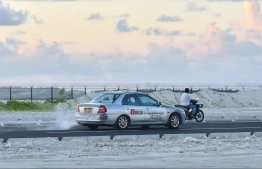 Vehicles earlier required a permit by Maldives Airports Company Limited (MACL) in order to enter VIA. Transport Authority has not commented yet on the local taxi centres’ decision to announce the rates.